Sometimes we all need a quiet place to rejuvenate, or a bustling space where we can feel part of the community. In many ways, well-designed spaces positively impact mental health. 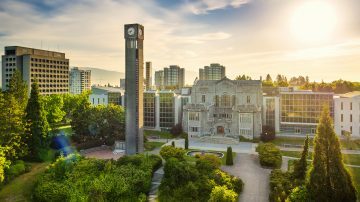 Let’s explore some of UBC’s favourite places and spaces! 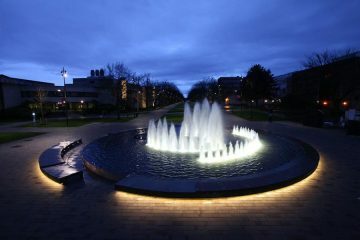 The soothing sound of water flowing down University Boulevard is a welcome distraction to calm the mind and cozy up to a good book or catch up on class study material. The intersection of University Boulevard and Main Mall is the busiest intersection at UBC, crossed by thousands of people every day. Sitting by the new fountain at Martha Piper Plaza is the ideal spot for meeting up with friends, watching passerby and enjoying the vibrant energy of campus life. 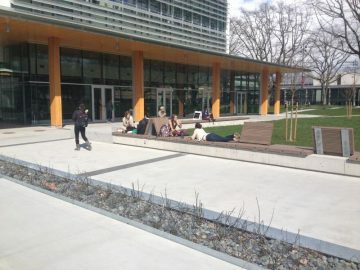 Next time you’re taking a stroll on Main Mall, be sure to stop by Fairview square – an outdoor commons space beside UBC’s Earth Sciences Building. This fun public space features lots of outdoor seating arrangements, including comfy ‘wave’ chairs and large tables that are perfect for outdoor lunches, lounging, or simply hanging out. The large open lawn in Fairview Square is also great for tossing a Frisbee or other kinds of casual sports. 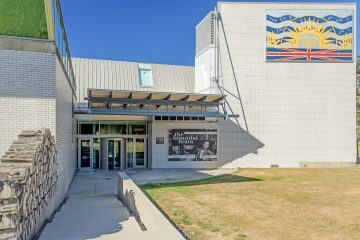 More than just a library, this building features contemporary artworks, the Chung Collection permanent exhibition, rotating exhibit space, Ike’s Café, and an array of resources and services. If you’re in the mood for a good book (or a nap), this 250,000 square foot facility boasts lots of different learning supports and cozy spaces. Located North of Koerner Library and flagpole plaza, UBC’s rose garden offers a spectacular view of the ocean and mountains. In summer, you can soak up the sweet smell of more than a dozen different roses. Year-round, the crisp ocean breeze and the exceptional view of the mountains never fails to provide a calming backdrop. Make a little ‘Zen time’ in your day, and head down to this scenic location. This is considered to be one of the most authentic Japanese gardens in North America. It’s free for students and staff to enter – all you have to do is show your UBCcard. If you’re ever feeling stressed, one loop around Nitobe will help settle your mind. At 24 hectares, it’s the only working farm in the city of Vancouver. It’s also a unique academic centre that aims to transform l food systems towards a more sustainable future. The UBC Farm is on the south side of campus and is the perfect spot if you want a break from concrete and glass. Connect with the land, and see where some of UBC Vancouver’s produce is grown. Ever wanted to see Vancouver’s coastal temperate rainforest from a bird’s-eye view? Well now you can. This unique feature is a series of 20-metre high walkways suspended from huge trees, some of which are over 100 years old. If you’re seeking a bit of a thrill, and want to learn about the forests surrounding this campus, check out this great campus feature. Test your leg strength on the 500 stairs down to the sand and enjoy the vast expanse of ocean in front of you. Keep in mind, Wreck is Vancouver’s only clothing-optional beach, so while the views are stunning, you may get an eyeful. Also factor in the time it takes to walk back up if you’re visiting on a lunch break. This 874-hectares park located in the University Endowment Land offers 73 km of trails amid old-growth trees and a boardwalk across a bog. If you ever need to take a walk through nature, this park is your answer. The Museum of Anthropology houses one of the world’s finest displays of Northwest Coast First Nations art in a spectacular Arthur Erickson designed building overlooking the mountains and ocean. It also features inspiring art from around the world, temporary exhibitions, and public programs. From classical, jazz, and world music to theatre and opera, the Chan Centre at UBC is known for its striking design, stellar acoustics, and exceptional programming. Since opening in 1997, it has hosted artists and speakers such as Yo-Yo Ma, Kronos Quartet, Gilberto Gil, Mariza, His Holiness the Dalai Lama, Mavis Staples, and Chick Corea. Internationally recognized for its exhibitions, programs and online projects, the Belkin Art Gallery is one of Canada’s premier showcases for contemporary art. The gallery specializes in Canadian avant-garde art of the 1960s and 1970s. 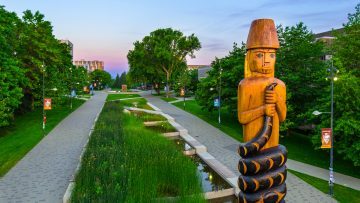 Download the UBC Outdoor Art Tour from their website and discover UBC in a new way – all for free. Walk in and be astounded by the sheer size of the largest creature to have ever lived on earth—a blue whale. Explore two million specimens from botany, zoology, and entomology in this natural history museum. Get hands-on in their daily programs; enjoy feature exhibitions, their gift shop and Niche Café. Located on the south end of campus, the skatepark is a great place for those wanting to work on their ollie. You can “hit the books” all afternoon, literally, with the massive book sculpture on the edge of the rink.